He was one of Waycross High School’s finest all around athletes. He lettered in football, baseball and track during a brilliant high school career. During the 1958-1961 seasons he scored 57 touchdowns, rushed for 4058 yards and in 1960 led the Bulldogs to their first undefeated season and the State AA Championships in 1960 and 1961. Among his honors were best all-around athlete, in 1959, Hurst was named to all-region, all-state, all-southern, Region 1-AA MVP, Georgia AA back of the year and was named best blocker at Waycross High School. He was named captain of the 1961 All-State team as well as MVP, best back and best all around athlete in 1961. He pitched and played outfield for the Bulldogs all four of his high school years and was named MVP in 1962 when he batted .375. In track he ran the 100 yard dash, was a member of the 440 yard and mile relay teams and went to the state finals in each of his four years. He received a full scholarship to the University of Georgia to play football. 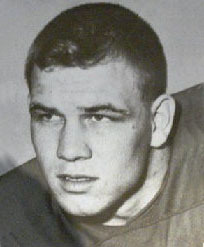 He lettered in football three years at the University of Georgia playing fullback and defensive linebacker on the Georgia team that won the 1964 Sun Bowl. He is married to the former Christine McQuaig, who was an outstanding member of Waycross High’s girls’ basketball team. They have two daughters, Page and Amy. He makes his home in Waycross. If you need any information on this member or need assistance, please contact us.